… and it’s available for pre-order on Amazon. 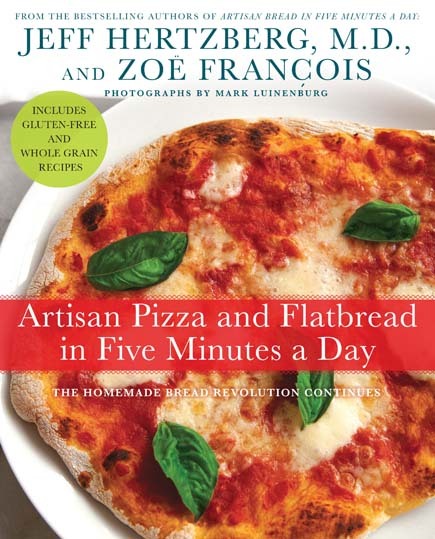 We are so excited, and it comes on the heels of the Wall Street Journal’s weekend announcement that our first book, Artisan Bread in Five Minutes a Day, had made the Journal’s best-seller list for the second week in a row. Best-seller lists are not common for books that have been out for four years. Thanks to all of you for helping our work come to fruition this way. Our pizza book’s official publication date is October 25, 2011, so if you pre-order now, Amazon guarantees that your actual price will reflect the deepest discount they’re offering at the time the book ships (it’s 35% off list price now). Out of interest, can you tell me if your editors and publisher have seen the light and included metric measurements in the recipes? Thanks in advance and congrats on making the WSJ list. … that post has links to the Amazon UK site where you can buy the book. Thanks for the reply. I have that book (in both versions!) and I was simply wondering if your forthcoming book (Pizza & Flatbread) would also include metric measurements…? Congrats on the best seller list! As more of us have been using your method (practicing and improving) over the last few years, the word has spread. Just recently, as a completely amateur baker, I made all the bread for a 60-person dinner using your recipes. More than a few folks were interested after seeing how easy it was! Conrad: Thanks for the kind words. My kids have been doing this since they were 4. Hi, I bought the kindle version of your original book. I am thrilled as I have thrown out my sourdough starters and “weekend” bread projects. My question concerns your deli rye recipe’s cornstarch wash. What does the cornstarch do that a regular water wash wouldn’t ? Also why not use this wash on the basic loaf? Thank you for the book and reinventing home bread baking without sacrificing quality. I am more interested in flatbread than pizza. What kinds of flatbread are included in your new book? Indian? Middle Eastern? I can’t wait for the publishing date. It will be perfect for my B-day present. On the topic of pizza, the Red Wine and Cheese bread dough from HBin5 makes a wonderful pizza crust. Yummy! Looking forward to your new book! Congratulations on the new book – the cover art is beautiful. A random question for you – I made yogurt last night, and strained it to make Greek yogurt. I now have a whole lot of whey! I’ve read that you can use whey in bread recipes (as a buttermilk-similar tenderizer?) and was wondering if you have any experience with this in any of your recipes? Like I said, random question, but I thought I’d ask the experts. Such a weird coincidence, I strained some yogurt last night to make Greek yogurt, and it’s not something I do often. I also make my own ricotta/paneer, and I always use the whey as the liquid for bread dough. It works beautifully– a way to throw some extra nutrition into the bread. Can’t wait to get the new book! I was craving a pita pocket sandwich with hummus and veggies a few days ago, I told my mother-in-law that I’m sure there’s a recipe in HBi5M and sure enough, there was! I had a recipe of the Master dough in the fridge and while the pita bread baked I whipped up some fresh hummus and cut up some veggies from the farmers market. My 4 and 6 year old girls LOVED it! It will definitely be a staple this summer! I am in Australia and loving your two (so far) books. Spreading the word about your books downunder too. I have a question about chia seeds. Is there a way I could incorporate chia seeds into the bread. I like them for their nutritional value. They become gelatinous when they hit water so that could be interesting when they hit the wet dough? Have you tried them? Would they be able to last 2 weeks like the dough? Many thanks in advance! Have a great Sunday! After being a passionate baker for awhile now, I think I may need to switch to gluten free baking. I got talking to a gluten free customer about her symptoms, and they matched my recently-acquired symptoms! I’m getting tested right now. I’m determined to figure out ways to make nice fluffy loaves of bread. I am going to have to pull out all the tricks to do this! I can’t use vital wheat gluten, but I notice that the Hodgen’s Mill brand includes Vitamin C. I remember an old breadmachine book saying that vitamin C can help breads rise. Do you have any suggestions on using Vitamin C in gluten free breads? I’m also glad you are including gluten free pizzas in your new book. That is an interesting question, the acid in vitamin C strengthens the gluten in the dough, so I’m not sure it would have any significant influence in g-f breads? Try adding a small amount and see if it makes a difference. I hope they are using better book binding in this new book! The HBin 5 book binding fell apart right away. I made your original Challah Recipe tonight and it came out good texturewise and looked great. The flavor was not great. It was missing some sweetness to it. I used Brummel and Brown yogurt butter, and used 2 cups of cake flour because I ran out of the regular stuff. Other than that I followed the recipe. Think the missing butter it? Jeff: Did you decrease the salt? Or the honey? Have you made it before following the recipe exactly and found the flavor to be better? Any chance your cake flour is old? Stale flour gives a flat taste. Is there a difference between protein and gluten in flours?? Because of the my flour sites said it strenghtened protein bonds. If that’s true, garbanzo bean flour has higher protein than rice flour (same source). And vitamin C would help protein, and not just gluten. I tried making a bread with the olive oil gt stored dough, and it didn’t rise after the suggested time. The next time, I tried bringing the bucket to more room temperature, putting the amount of dough in loaf pan. I put the loaf pan in the microwave to rise, along with a steaming cup of water. Much better rise. It seems that keeping everything warm helps. Another site (when I want to learn, I really go for it!) said to keep g-f flours in fridge so they won’t go stale quickly. However, mix up the flours and leave them on the counter overnight so they are room temp so they are ready to bake. It may be hard for me to isolate what’s helping, so I’m trying to add only one thing at a time. Judy: Gluten is a type of protein that forms from precursors that occur in wheat, barley, and rye. So most of the protein in wheat is comprised of the gluten precursors. Other grains have protein, but it’s not that stretchy gluten. If you leave out the vital wheat gluten in our second book, you’re going to have a hard time storing the dough. Hi jeff it was my first time making the challah. Would you recommend more honey to get it a kittle sweeter? You can add a few more tablespoons of honey or sugar to the challah without changing anything else in the recipe. Beyond that and you will need to make other adjustments. Thus, the challenge in making gluten free breads to be fluffy!!! Is it chemically impossible? PS–I love your challah recipe, but have found that sugar is much sweeter than honey. Maybe Jeff Feldman can try some honey? Light and fluffy are not words that are normall associated with g-f breads. Our g-f brioche is lighter than the others, but I’m not sure that is the texture you are going for either? I have the Healthy Bread in 5 book and I’ve been wondering which recipe would be the best to use for sub-type sandwiches? I would use either the Challah or the Brioche. They have a lighter texter. I’ll try the g-f brioche recipe next. So far, I’ve only done the one with olive oil. I love Chinese bing. That alone has sold me! Hi…I recently bought Kindle version of your book…loved it…and tried the Master Recipe….excellent outcome…..loved it…..but I have a question about rolling dough for a pizza…. The dough really wouldnt roll nicely….would spring back to smaller shape than I rolled….I wanted thinner crust….so any tips to prevent this? I used Master Recipe dough for pizza. Thanks Jeff. I will try this. The MN weather is in the news, even here in VA. I hope you and your families are OK. I was curious about how many NEW recipes will be included in the new book? BTW I made the olive rosemary buns published in Cooking Club magazine and they are now my favorite bun/bread. There are about 100 new recipes! So glad you are enjoying the rosemary buns! 100 new recipes, now I am extra excited about getting my hands on this new book. I am definitely enjoying the others so if the next few months fly by we’ll have that book in no time. Do you have a pizza recipe that uses a high gluten flour such as King Arthur Sir Lancelot? I really don’t think you can make an adequate NY-style pizza crust with all-purpose flour. You can use a higher protein flour, but you will have to increase the water. We have recipes that use all kinds of flours to achieve different types of crust. Can you substitute water with whey in your master recipes? I do that after I make yogurt. I prefer it with half water, half whey, but you can do any ratio you choose.